The annual end of summer dahlia spectacle is in bloom at the Roosevelt Campobello International Park at the Roosevelt "cottage" grounds. 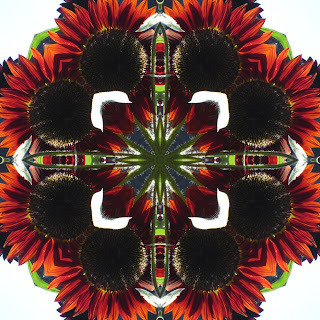 Every August I impatiently await this spectacle. I don't grow them myself as they take a lot of care: staking, removing the bulb from the ground in winter, protecting from slugs and earwigs, etc, etc. If you don't believe me, read all the instructions on this site for the care of dahlias: http://www.dahliabarn.com/dahlia-care.phtml. 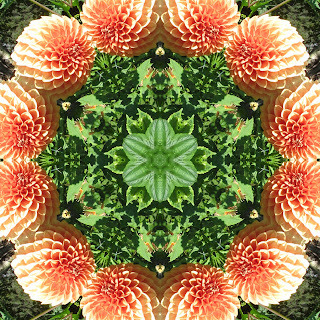 Luckily there is a platoon of gardeners to deal with the dahlias in the RCIP. 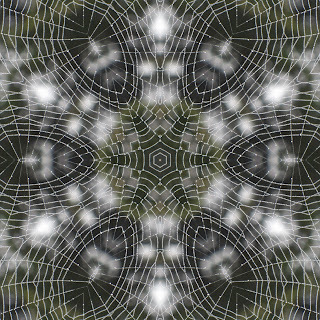 Next week I promise there will be spiderwebs and hopefully a book announcement. 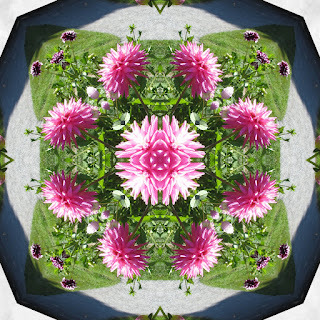 I am deep into finishing my book of the best kaleidoscope creations of the past year. 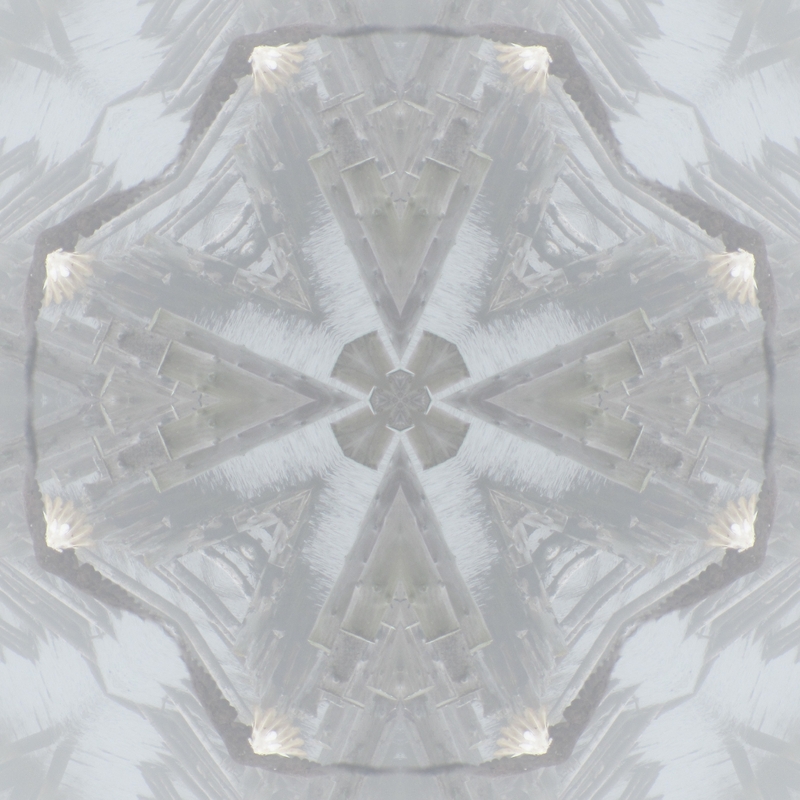 I expect to announce it next week! 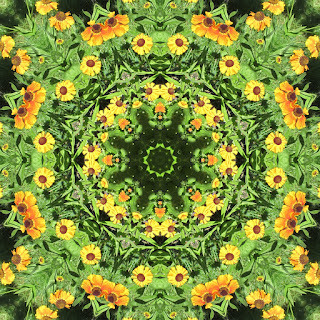 We are winding down the Friar's Bay Studio Gallery and have repopulated the Gallery with paintings Michael has brought back from the St Andrews show today. 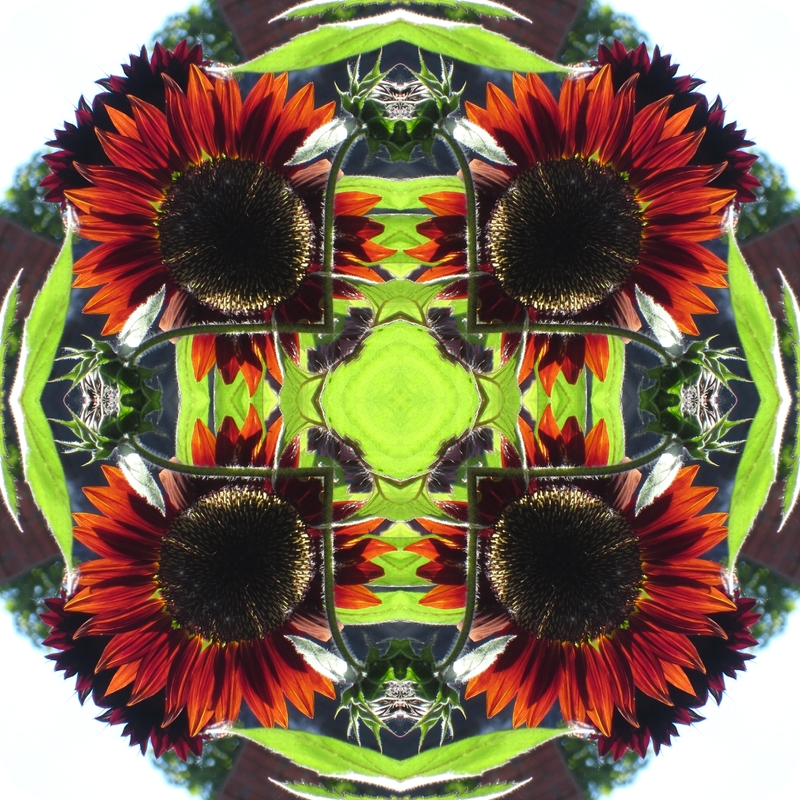 Come visit us at 822 Route 774, Welshpool, NB E5E 1A6. Don't use your GPS or Google Maps to find us as they seem to have wiped out all the data on the Island for those of us on Route 774 and despite lots of effort, I can't get the addressing corrected. 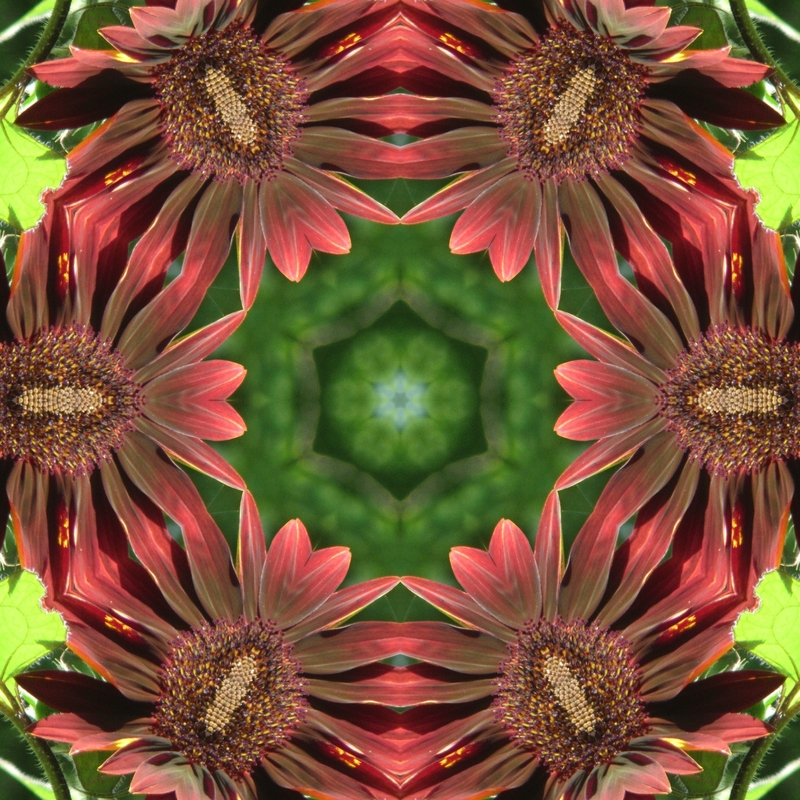 See our directions at: http://www.friarsbaygallery.com/ I would be happy to give you a tour of my gardens! 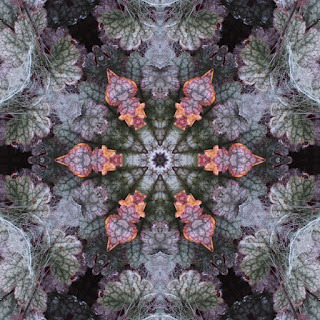 Below are kaleidoscopes of the 3 plants in my title today! 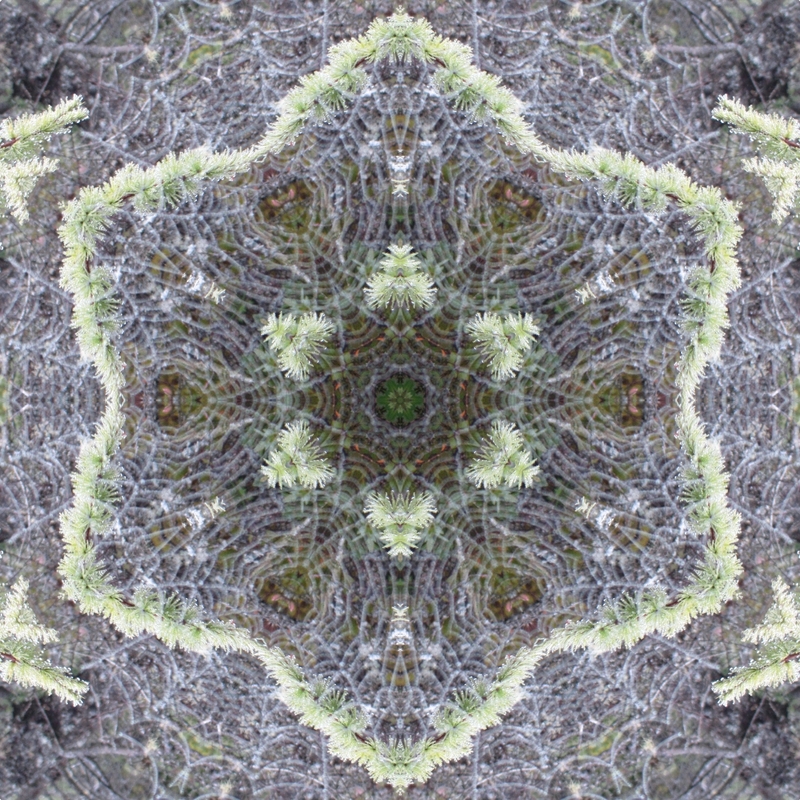 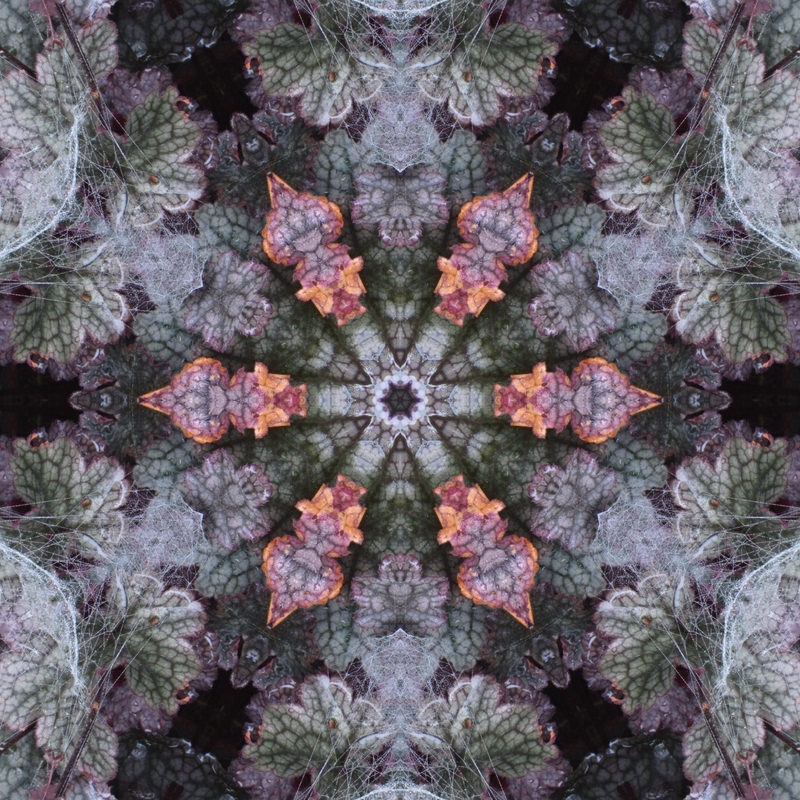 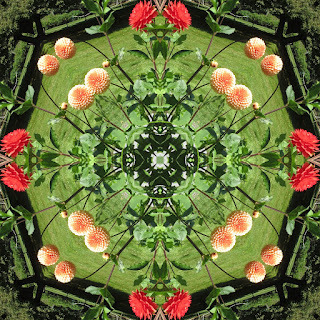 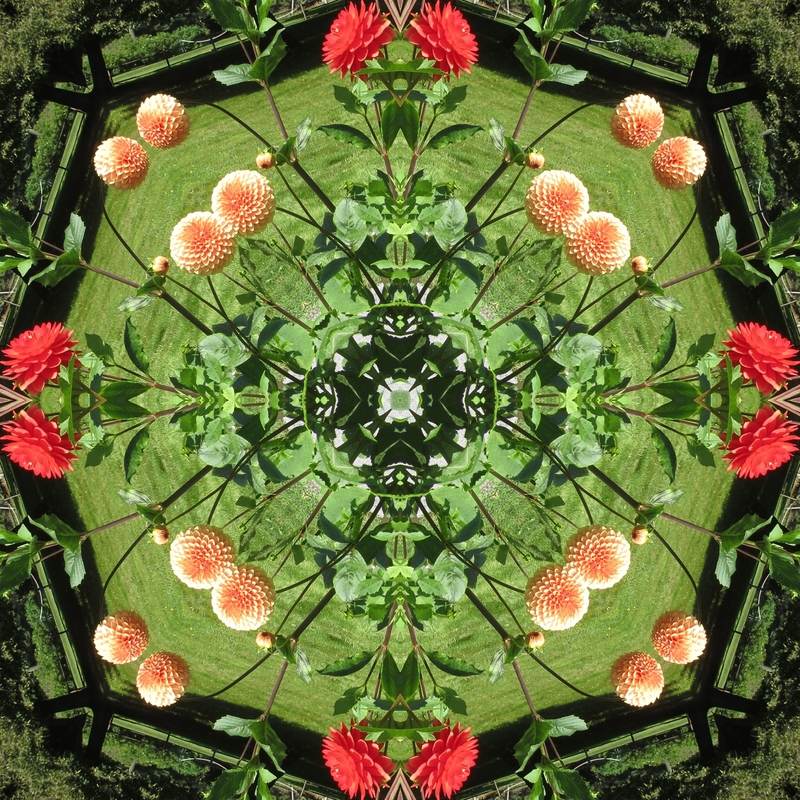 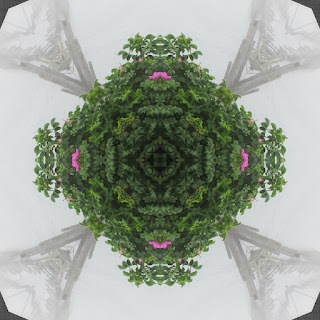 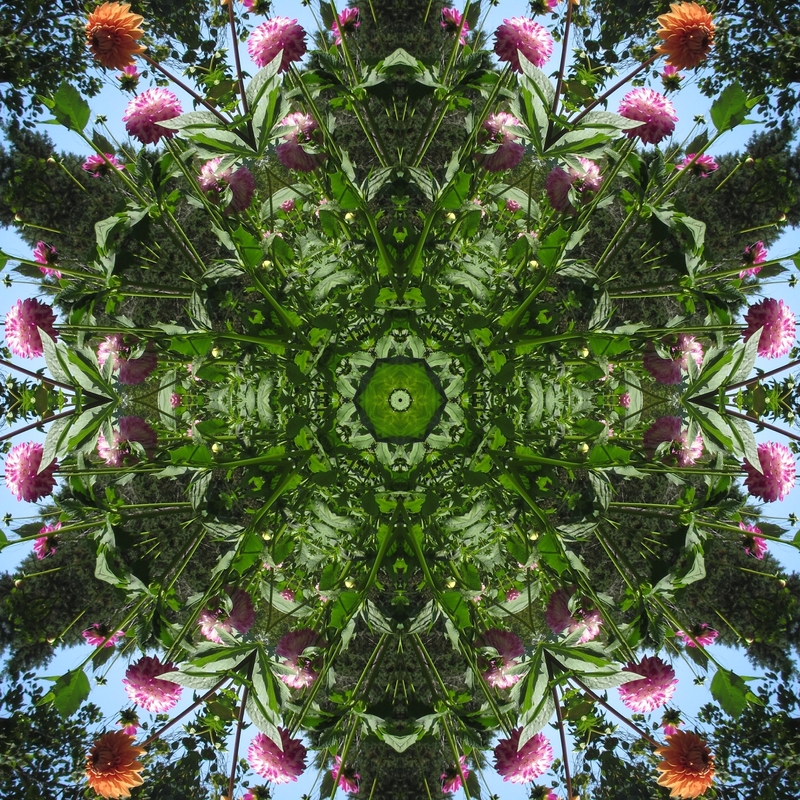 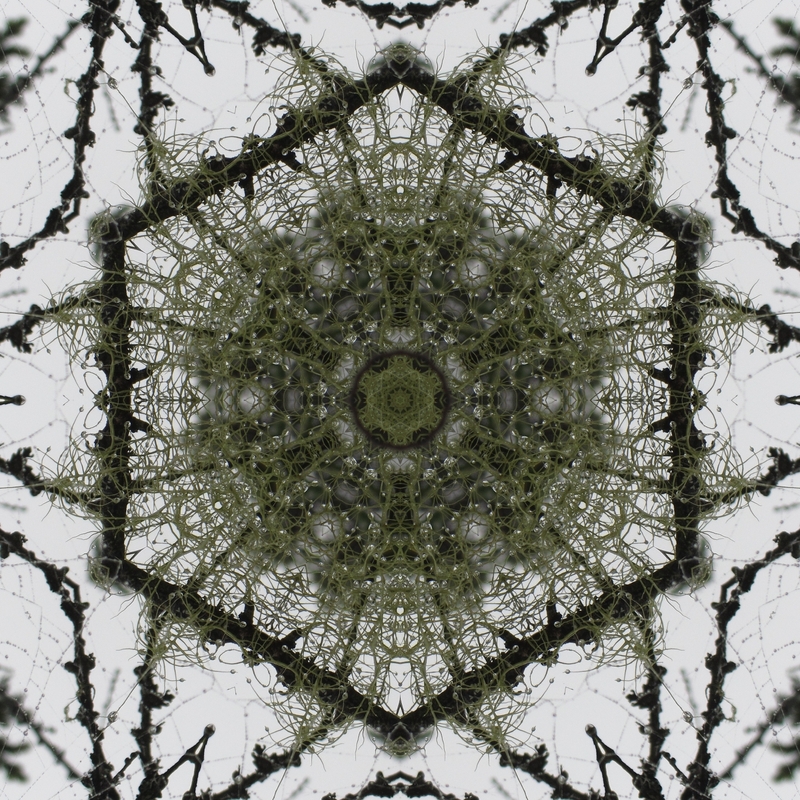 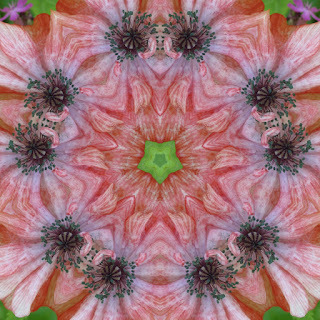 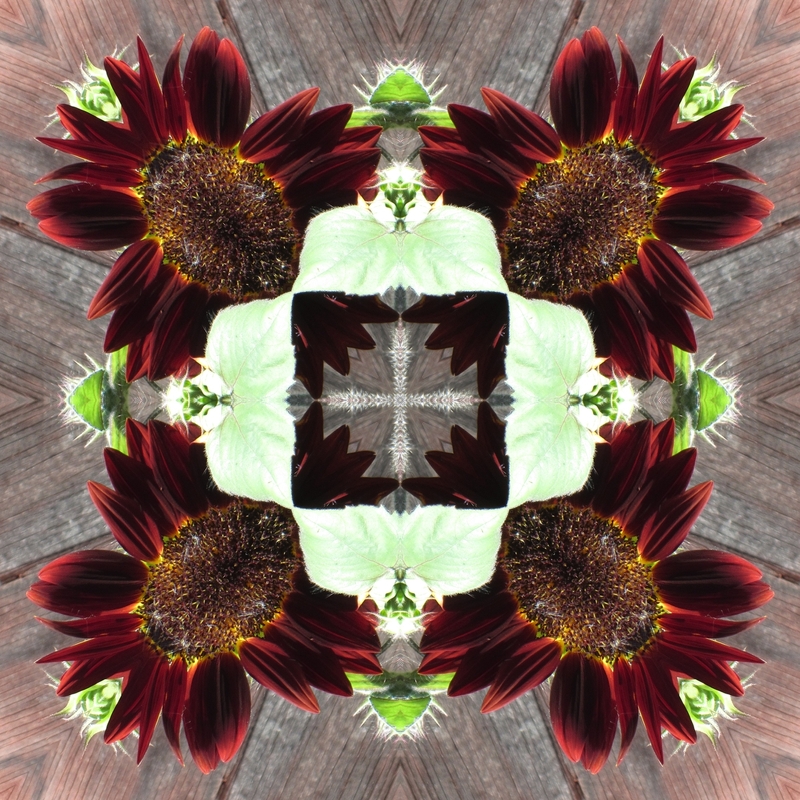 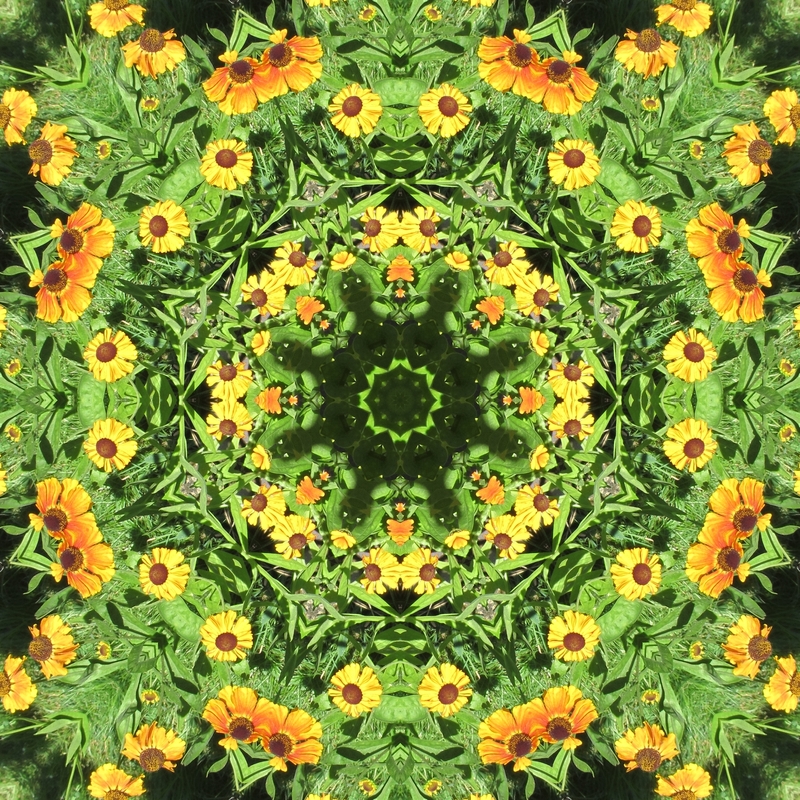 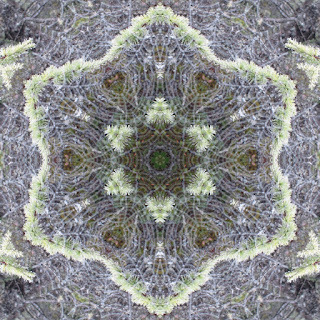 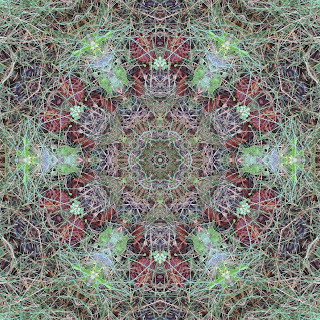 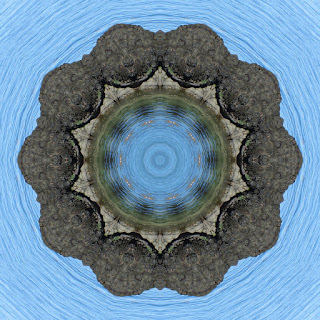 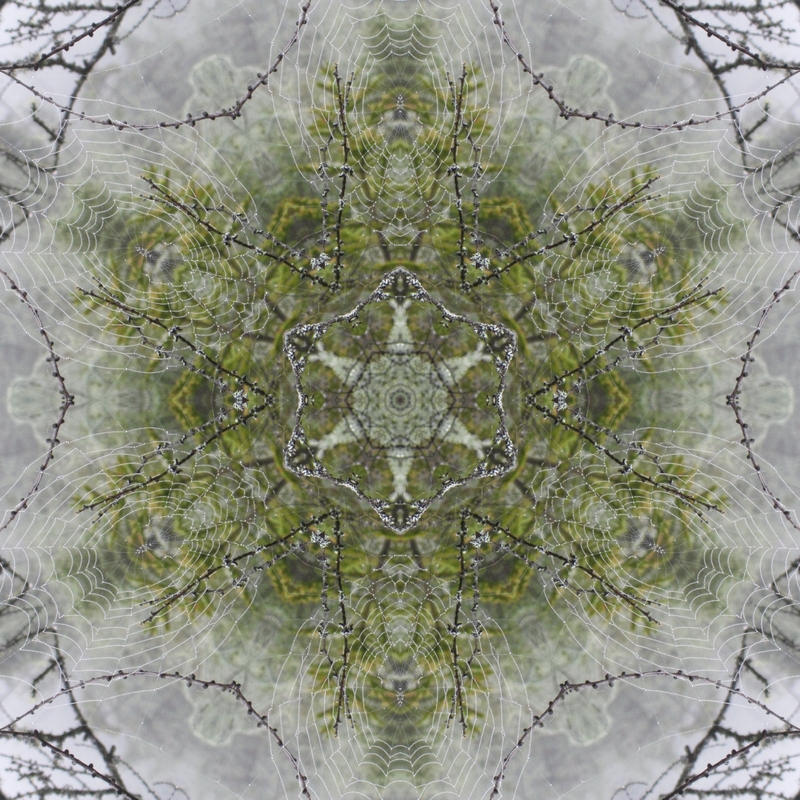 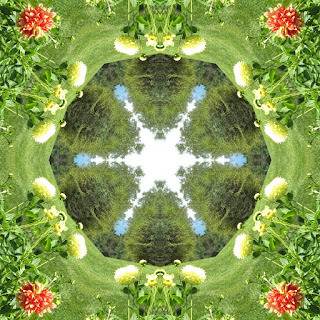 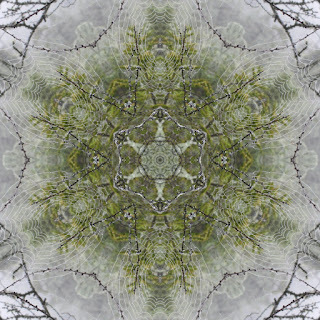 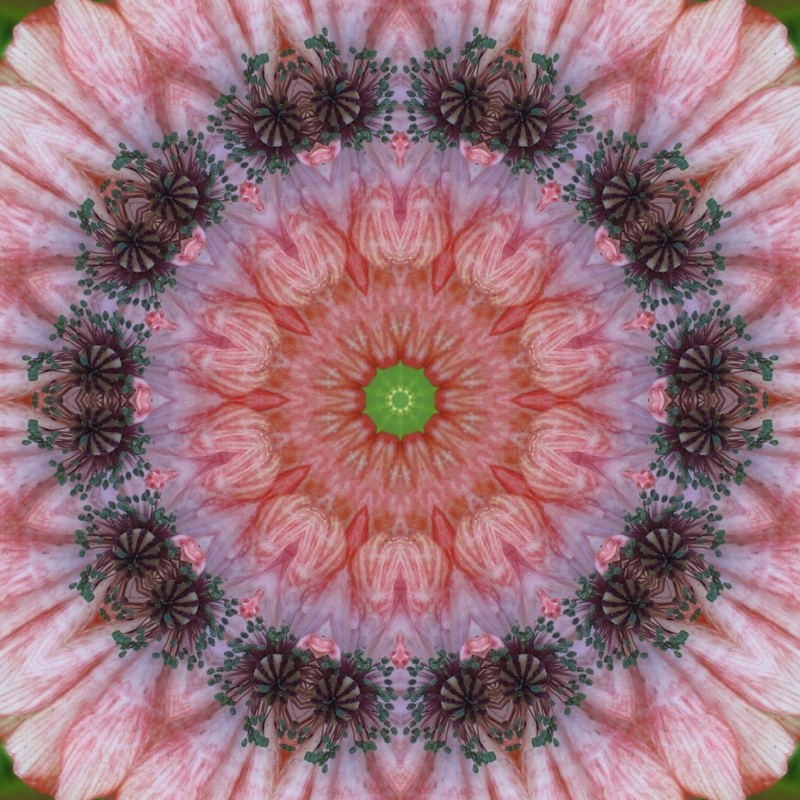 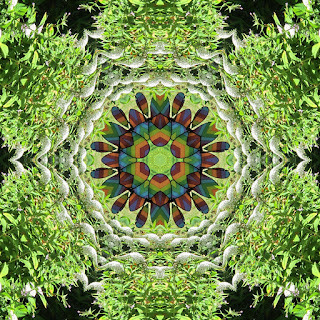 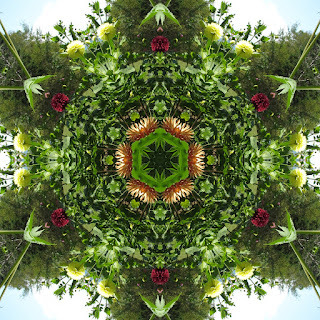 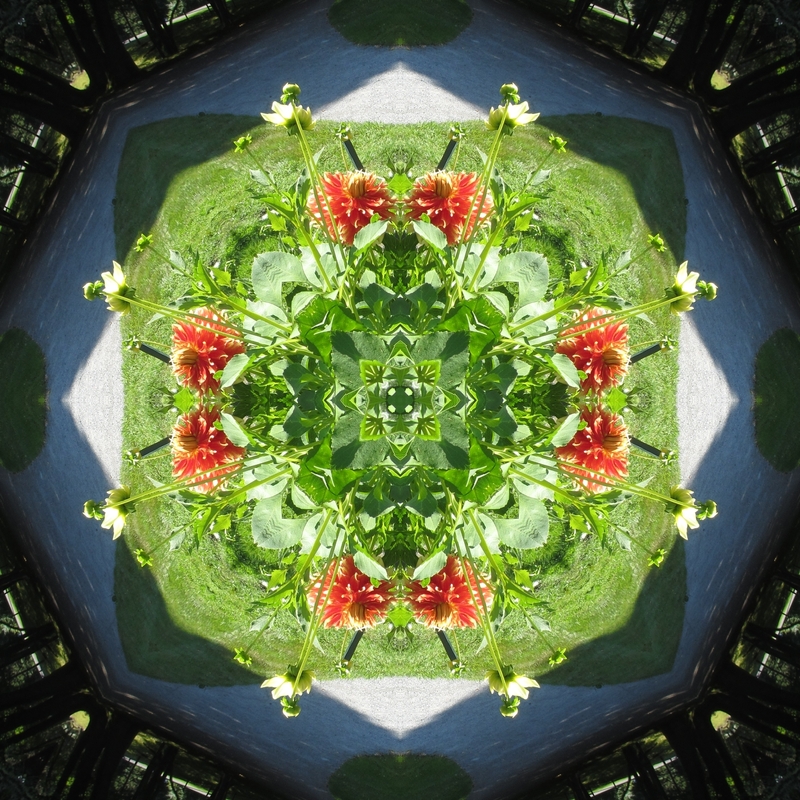 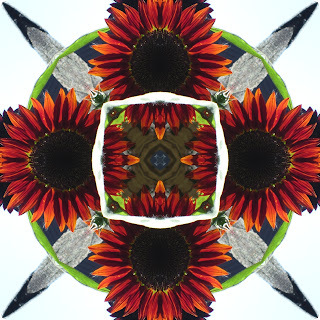 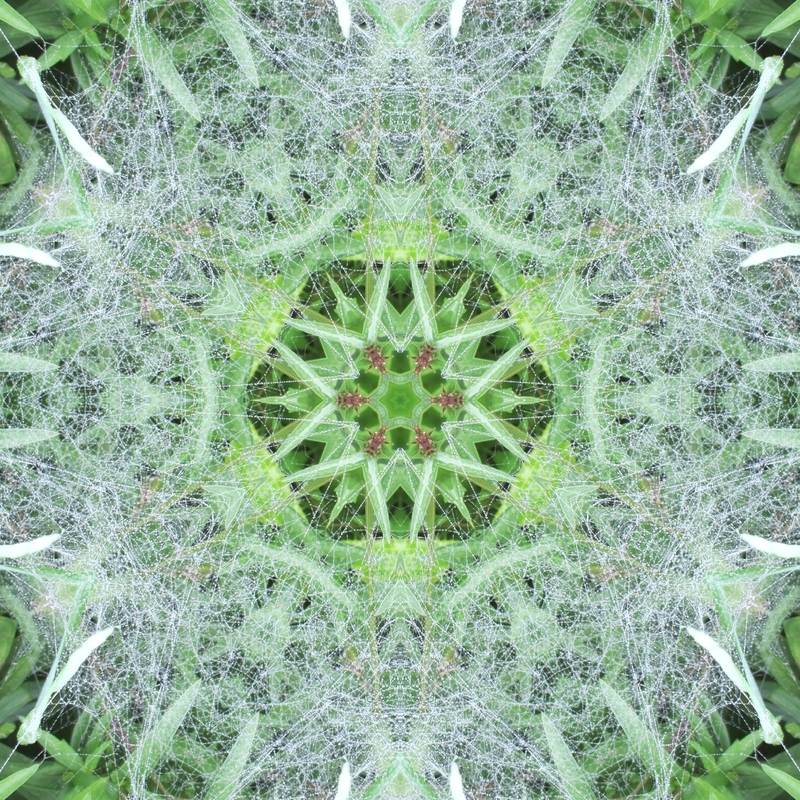 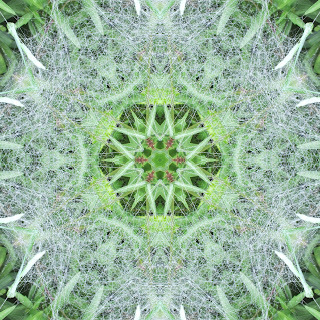 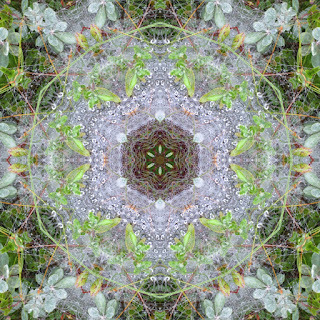 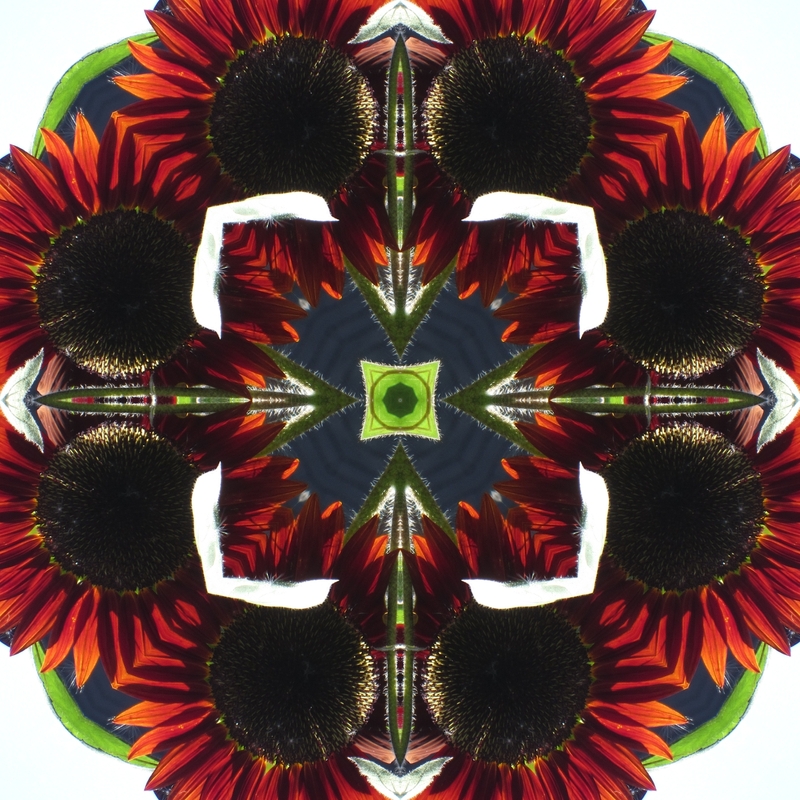 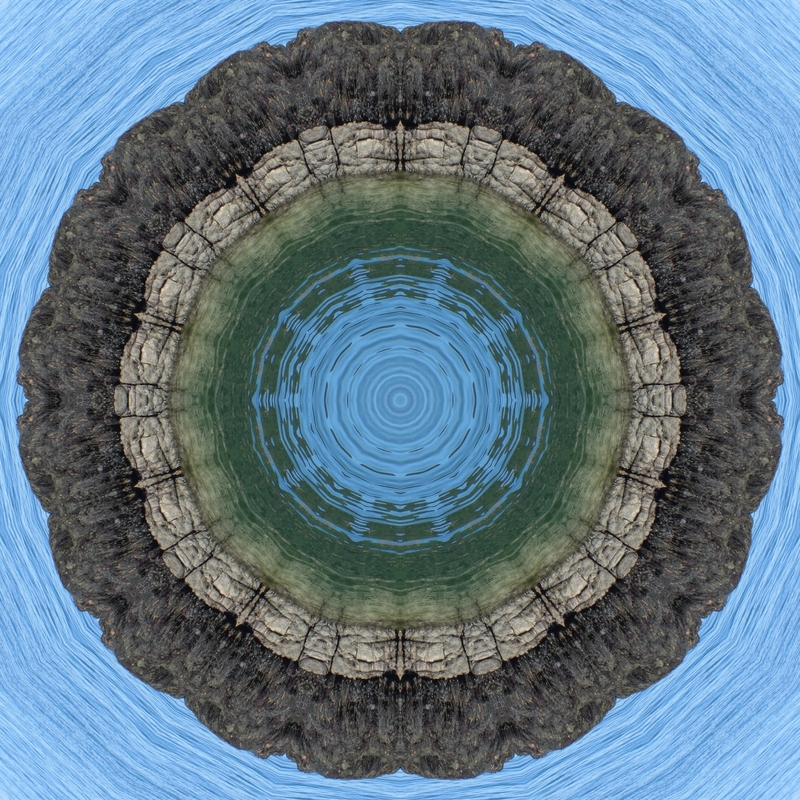 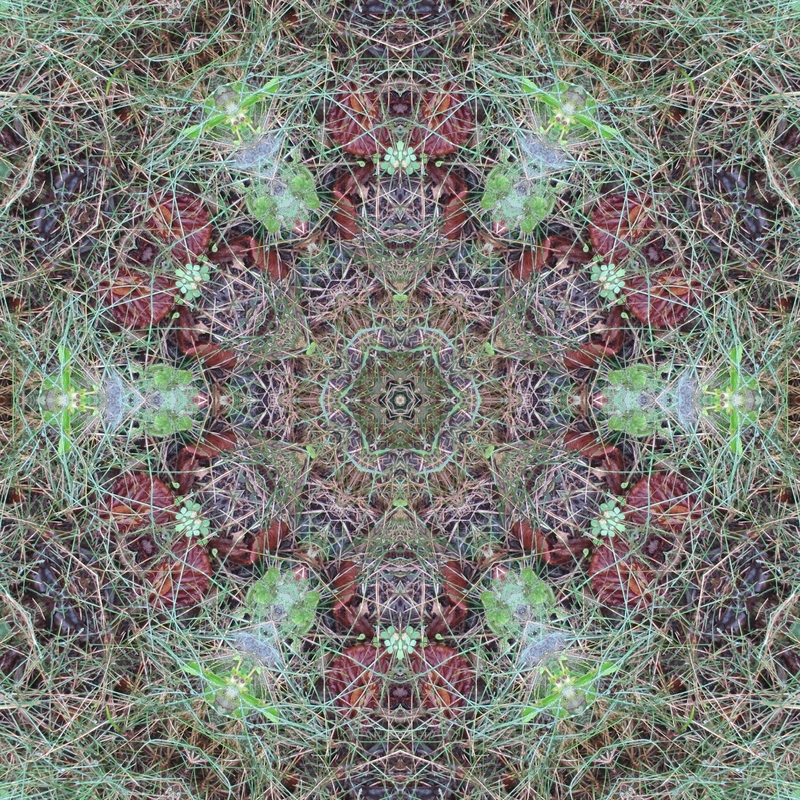 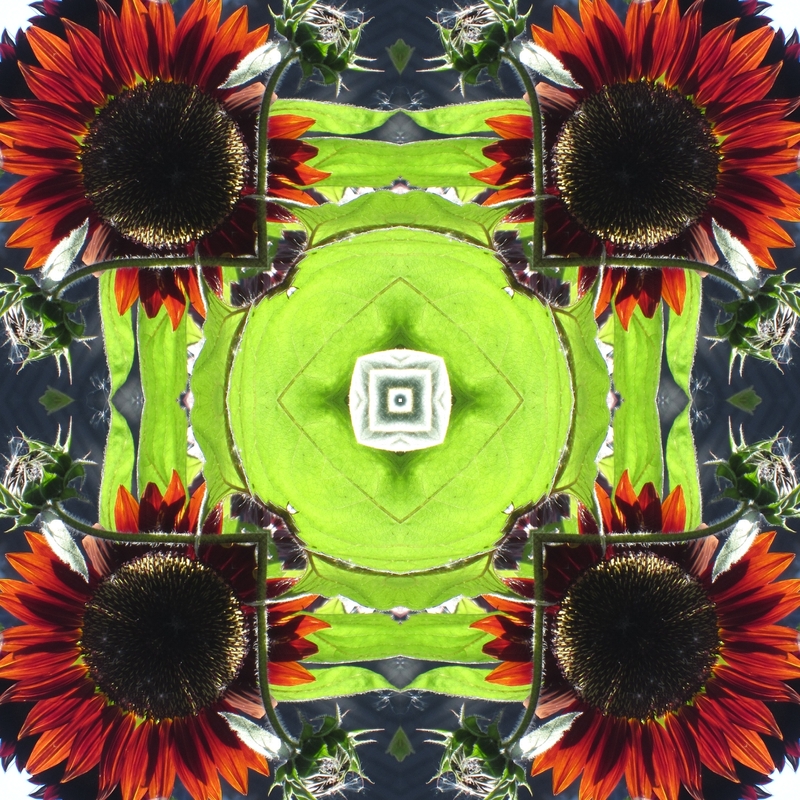 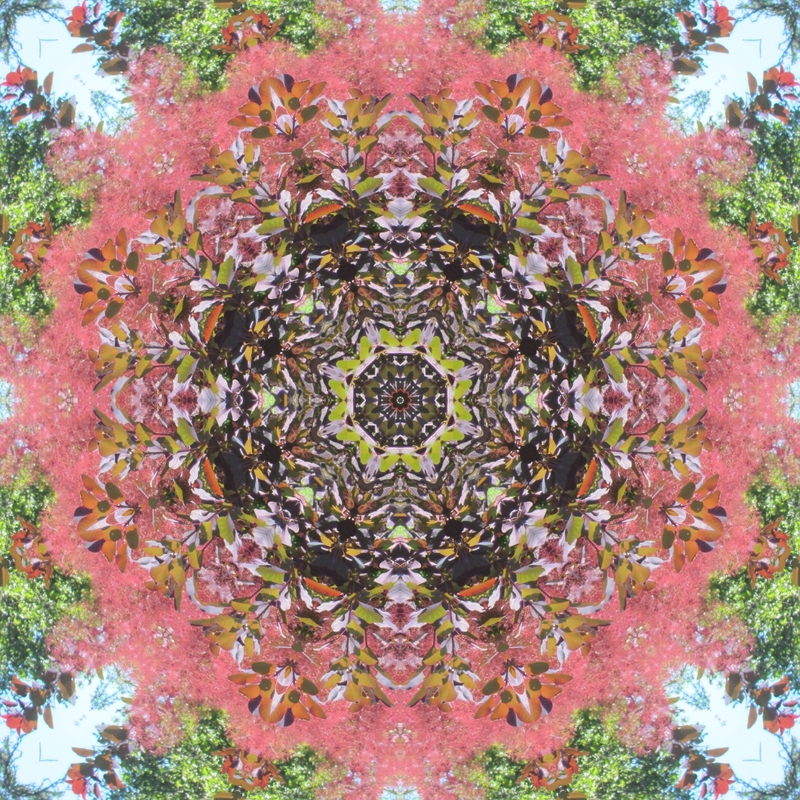 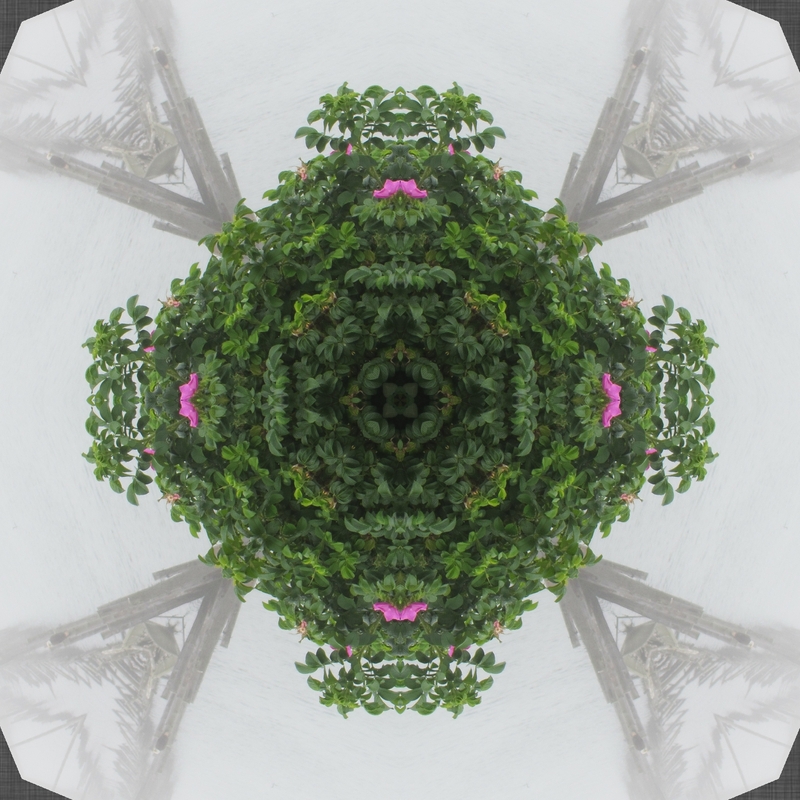 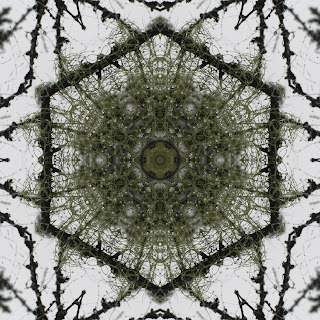 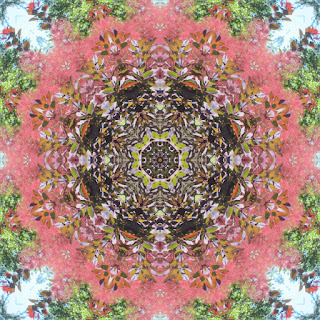 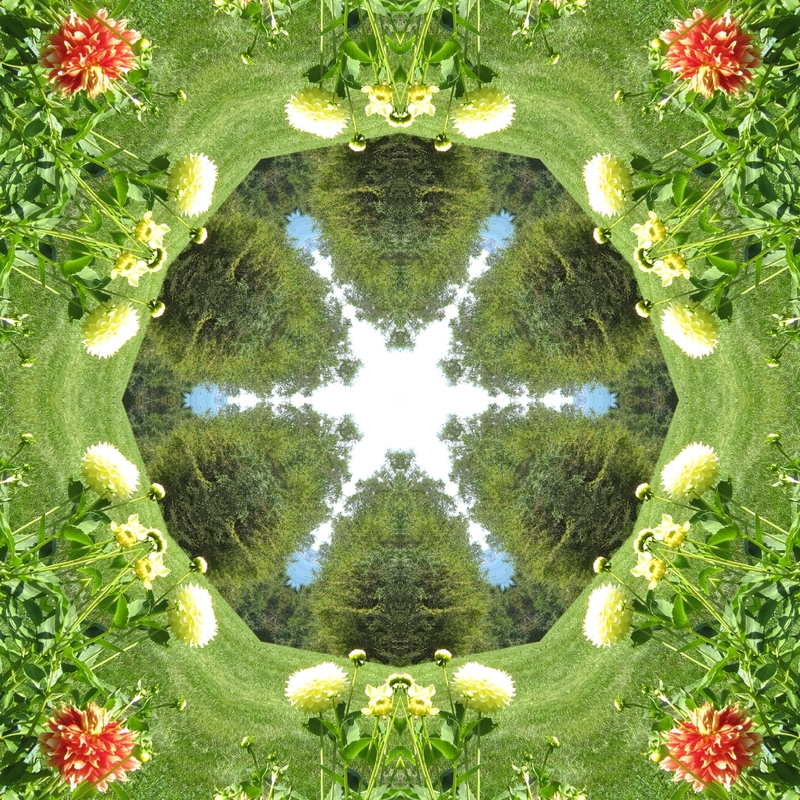 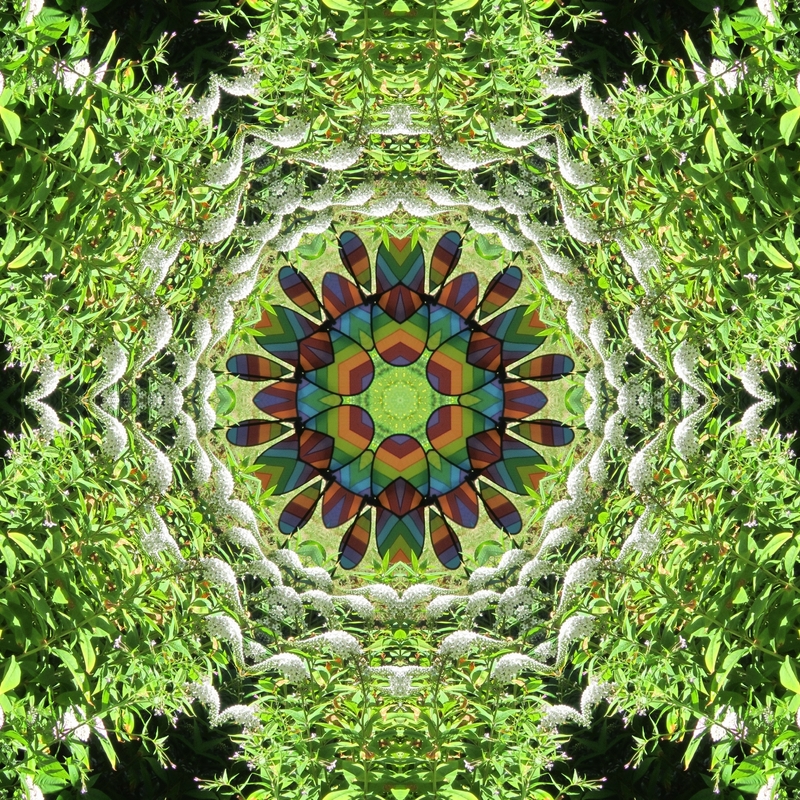 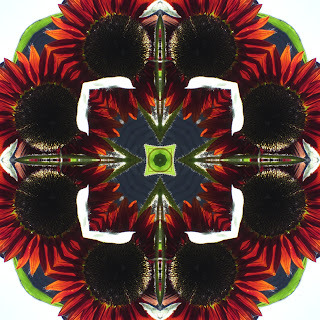 You will have to visit to see the plants from which I have created the kaleidoscopes! 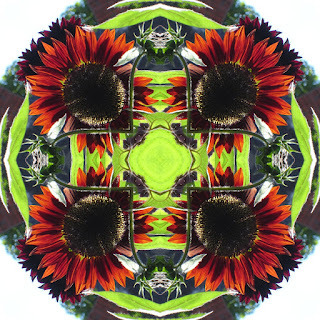 Maybe you will take home an original painting with you! 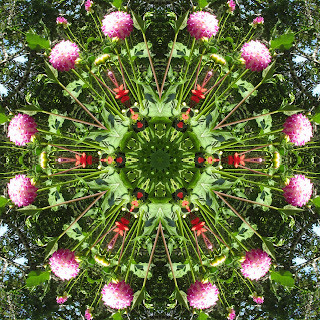 Kaleidoscopes at bottom of blog--see the bald eagle in these photos! 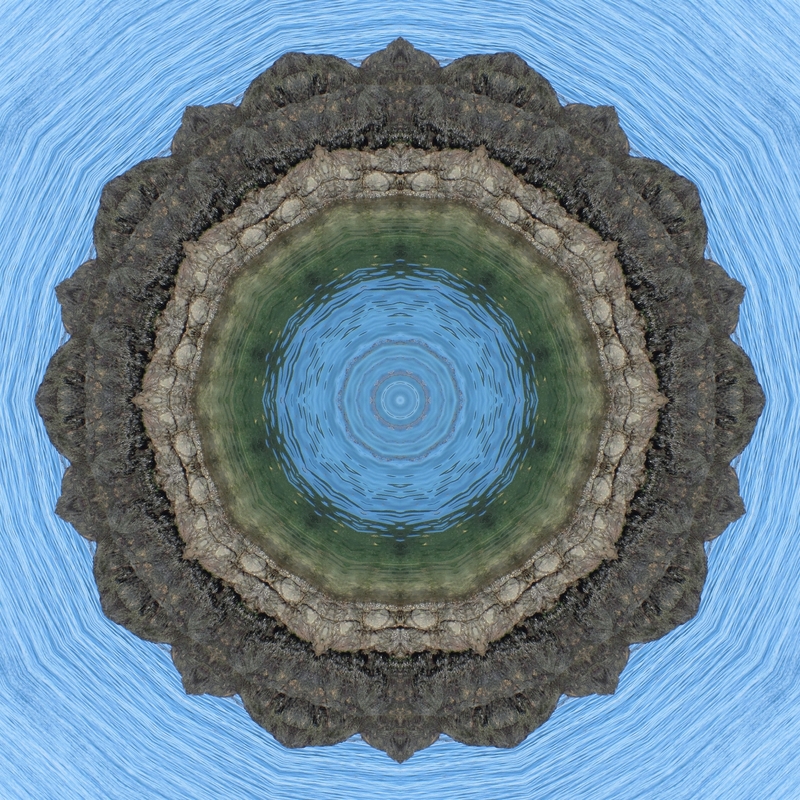 This was a big weekend on Campobello Island as we had two events celebrating history and many important people visiting the island such as members of the Roosevelt Family, Senator Collins, Senator Harkins, Member of Parliament John Williamson, and the Minister of Culture, Tourism and Healthy Living in New Brunswick. 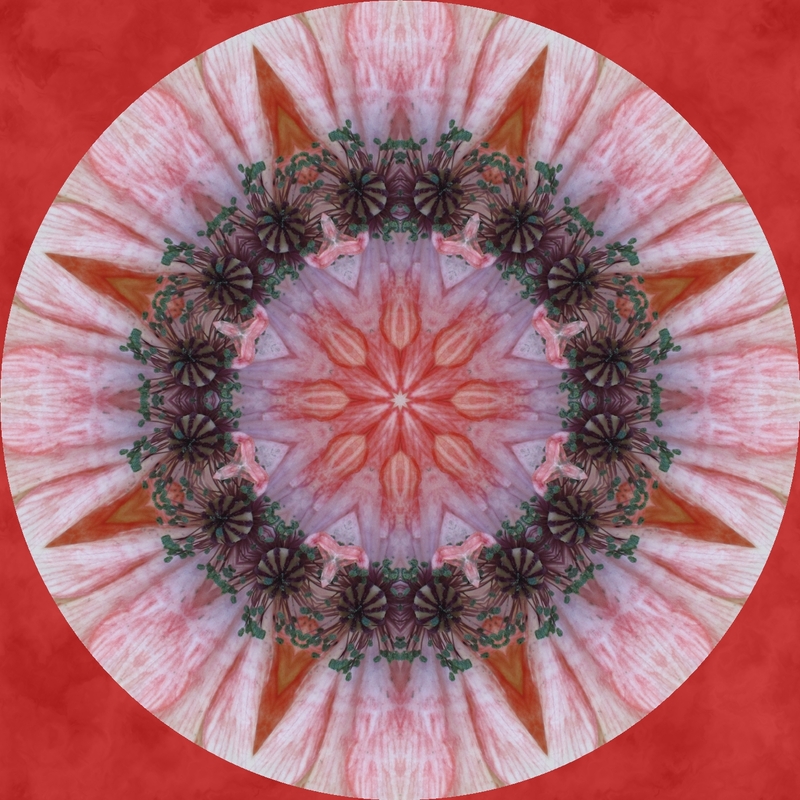 As usual the Roosevelt Campobello International Park Commission and Employees did a fantastic job putting the events together. One of my favorite moments was when a bald eagle paid a visit to Mulholland Point just moments before the Bridge Celebration began. 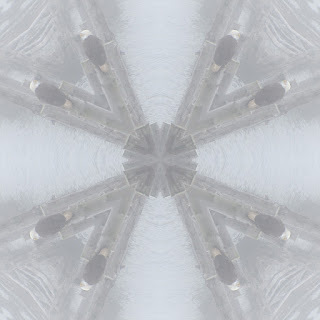 I decided to do 3 kaleidoscopes from 3 different pictures this week each featuring the bald eagle.